We’d love your help. Let us know what’s wrong with this preview of A Horse's Tale by Susan Lubner. In association with the Colonial Williamsburg Foundation. Readers will make new friends as they learn about colonial America. Garrick the Gardener’s horse is sad, so the town of Williamsburg rallies to try to cheer him up! Margaret the Milliner sews a counterpane for the horse’s back, and Ben the Blacksmith checks the horseshoes to make sure they aren’t on too tight. The gr In association with the Colonial Williamsburg Foundation. Garrick the Gardener’s horse is sad, so the town of Williamsburg rallies to try to cheer him up! Margaret the Milliner sews a counterpane for the horse’s back, and Ben the Blacksmith checks the horseshoes to make sure they aren’t on too tight. The grocer mixes oats and sugar, the apothecary stirs a special brew, and the music teacher even sings a happy song. But nothing lifts the horse’s spirits until they all discover that friendship is the best cure. To ask other readers questions about A Horse's Tale, please sign up. Absolutely loved it, pictures too. This is such a cute little story about a horse with no horse friends. I love that it rhymes and all the characters are little animals - a mouse, a bunny, ducks and more. What surprised me about this book was the attention to historical detail. The setting is in Williamsburg, Virginia. The language, places and jobs are all from the colonial time. There is a milliner, a town crier, a magazine and even a street named Duke of Gloucester Street. The author has included a glossary at the end of the boo This is such a cute little story about a horse with no horse friends. I love that it rhymes and all the characters are little animals - a mouse, a bunny, ducks and more. What surprised me about this book was the attention to historical detail. The setting is in Williamsburg, Virginia. The language, places and jobs are all from the colonial time. There is a milliner, a town crier, a magazine and even a street named Duke of Gloucester Street. The author has included a glossary at the end of the book with all the colonial terms she used. The glossary is a perfect addition to help students further their understanding of this time period and what life was like. I believe the fact the book rhymes would attract students to want to read/listen. The rhyming creates a flow that makes the story more enjoyable. I think the town crier, if done in a special voice, would also attract students. He is my favorite character. A teacher could build on the historical detail in order to find more books about historical Williamsburg and the lives of its citizens. They could read non-fiction books about that time period as well. This is an adorable story set in Colonial Williamsburg. The story centers on an unhappy horse. The setting is beautifully illustrated and takes you back to the time of Colonial Williamsburg. The town people try to help the horse that has run away from his owner and seems very unhappy. They try fixing his horseshoes and taking special care of him. One character notices him snuggling with another horse and brings it to everyone’s attention. They discover the horse is just lonely and provide him wit This is an adorable story set in Colonial Williamsburg. The story centers on an unhappy horse. The setting is beautifully illustrated and takes you back to the time of Colonial Williamsburg. The town people try to help the horse that has run away from his owner and seems very unhappy. They try fixing his horseshoes and taking special care of him. One character notices him snuggling with another horse and brings it to everyone’s attention. They discover the horse is just lonely and provide him with another horse to be friends with. The story shows caring amongst friends. The best part of the book is the illustrations. The pictures look just like Colonial Williamsburg and make you want to visit the actual place. There is also a Glossary in the back of the book that explains each of the jobs and people mentioned in the story. I would recommend the book to everyone with children especially if they enjoy history. 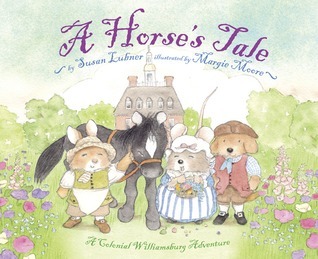 [A Horse's Tale: A Colonial Williamsburg Adventure] is a cute picture book with personified animals playing the part of people in Colonial Williamsburg. It functions as a way to introduce children to several of the jobs in 18th century America with a bit of the vocabulary while held loosely together through a story about a runaway horse. The rhyme is fun and the story is somewhat intriguing if a bit forced. Great for a trip to Williamsburg. Great book to talk about local history (I work in Virginia). Storytime tips: use the town crier to make a silly yelling voice for the kids. Also encourage the kids to make horse trotting noises by clicking their tongues or, if too young, patting their hands on their knees. This book was awesome! Erika had me read it three or four times. Looks like Mom picked a winner on our last trip in Williamsburg, Va!